Stop! 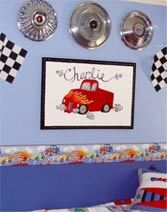 Bring Motor Mania to your kid’s bedroom. If your kid likes all modes of trains, cars and trucks then a transportation room is just for you. Just listen to our good advice and you’ll go from zero to race ready before we can say zoom. First set the scene. You’ll want to paint the top half of the wall blue and the bottom half green. Next paint a curving road all around the room or just on your accent wall. No artistic skills necessary. All roads naturally curve and so can yours. Now paint puffy white clouds on the ceiling and voila! You’ve got your scene. For the finishing touch attach toy cars to the road and hang model airplanes from the ceiling. Just note, your blues and greens can be as bright or as light as you want it – depending on the mood you want to create. Now for the furniture. A car bed is a great splurge but totally unnecessary for a great room. White or wood tone furniture will work just as well. A great idea for accent pieces is shiny locker style furniture. You can attach hubcaps to the furniture sides for an interesting effect. A collage of hubcaps on the wall is a great idea for décor, as well. Want to designate different areas in the room - a play, study or rest area? Use traffic cones. To bold for you- try mini cones as bookends. Make sure to hang traffic signs throughout the room. For a special touch create a street sign with your child’s name. Another way to personalize the room is the paint an airplane onto the wall or ceiling with your child’s name in its vapor trail. Now it’s time to Ready – Set – Go… Decorate!